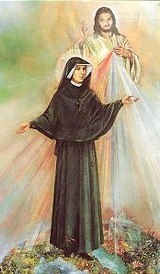 Christ told Sister Faustina, a young Polish nun, about the following seven sorrows that deeply troubled His Heart. Christ told her to write a diary so others would come to know and trust in Him. In a series of revelations He taught her that His mercy is unlimited and available even to the greatest sinners. Christ wanted us to meditate on these sorrows as a way of deepening our love for Him. Choose a week (seven days) and meditate each day on one of these sorrows. “My heart overflows with great mercy for souls, and especially for poor sinners. For them I dwell in the tabernacle as King of Mercy. I desire to bestow My graces upon souls, but they do not want to accept them. My Heart drinks only of the ingratitude and of the forgetfulness of souls living in the world. They have time for everything, but they have no time to come to Me for graces. “See I have left My heavenly throne to become united with you souls. “But I want to tell you that eternal life must begin already here on earth through Holy Communion. Each Holy Communion makes you more capable of communing with God throughout eternity. The Third Sorrow. Those in the religious life who receive Jesus in the Eucharist in sin. The Sixth Sorrow. Jesus is received without true love and devotion by chosen souls. The Seventh Sorrow. Jesus sees priceless souls perishing. Eternal Father, I offer You the Body and Blood, Soul and Divinity of Your dearly beloved Son, Our Lord Jesus Christ, in atonement for our sins and those of the whole world. For the sake of His sorrowful Passion, have mercy on us and on the whole world. Holy God, Holy Mighty One, Holy Immortal One, have mercy on us and on the whole world.